When I last left off, I had painted Luke and the cockpit tub. With that complete, I inserted the cockpit tub into the fuselage. 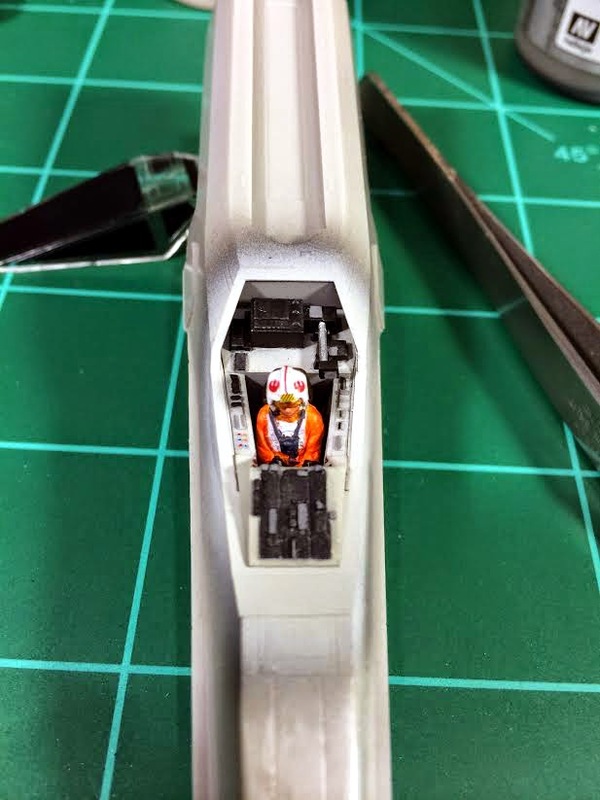 I had added a couple of strips of .01" styrene to fill the gaps between the cockpit tub and fuselage. After allowing the glue to cure, I attached the canopy with a couple of dabs of Mico Kristal Klear and applied the vinyl canopy masks and glued the two halves of the fuselage together. There was a small gap on the nose that I filled with Vallejo putty and sanded smooth. After that was done, it was ready for priming. While I waited for the primer to dry, I moved on to painting the S-foils. 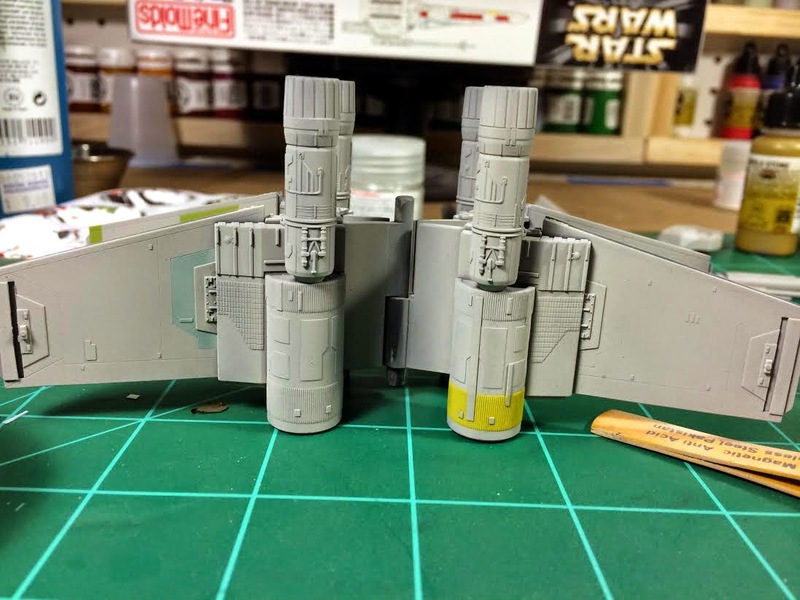 After giving them a basecoat of my X-wing color (Medium Gray + Flat White), I started painting various panels. The kit comes with a fairly extensive decal kit but I decided to hand paint them where ever I could. 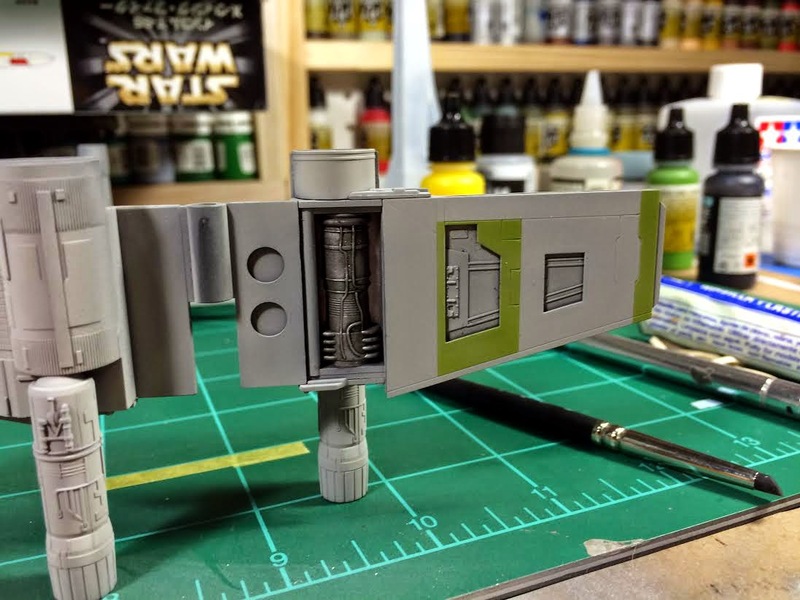 I started with the green panels (2:1 mix of VMA Pale Green and VMA Yellow) on the lower starboard wing. Here is where I hit the first setback of the project. 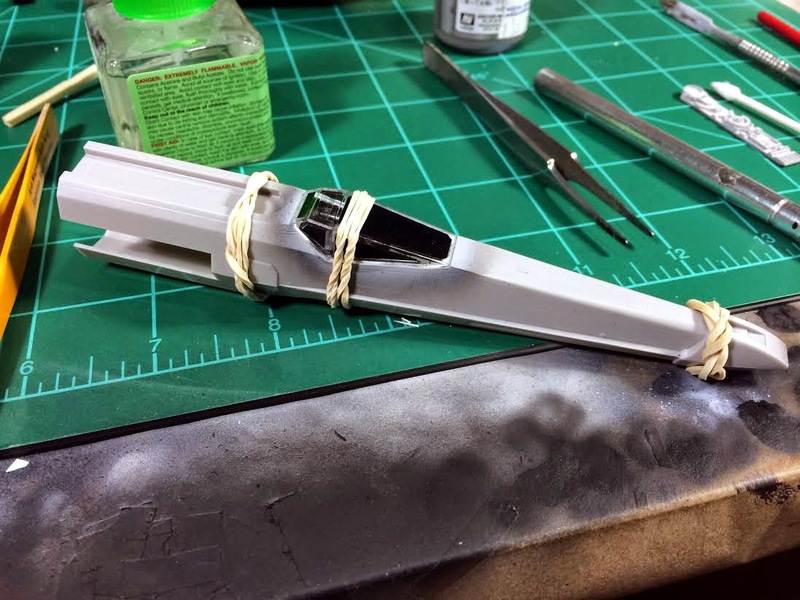 I decided to use Micro Mask masking fluid to mask off the interior of the wing. After painting it, I tried to remove the mask and it pulled up the basecoat and some of the primer! Frustrated, I removed as much as I could and repainted the insert. The second time around, I used the decal sheet to cut a mask out of 18mm Tamiya Tape and used that instead. I painted the exposed engines with a mix of VMA Steel and VMA Black, gave them a wash of GW Badab Black and highlighted them with some Tamiya steel pigments. I moved on to the top starboard wing and painted a light blue panel with Tamiya Light Blue (XF-23). This panel was not in the decal sheet but it is plainly visible in the photographs of the studio model. I also painted painted the top port intake cover Tamiya Flat Yellow (XF-2), another marking not called out on the decal/color sheet. I protected everything with a light coat of Future after these panels were done. Now it was time to seriously test my patience. 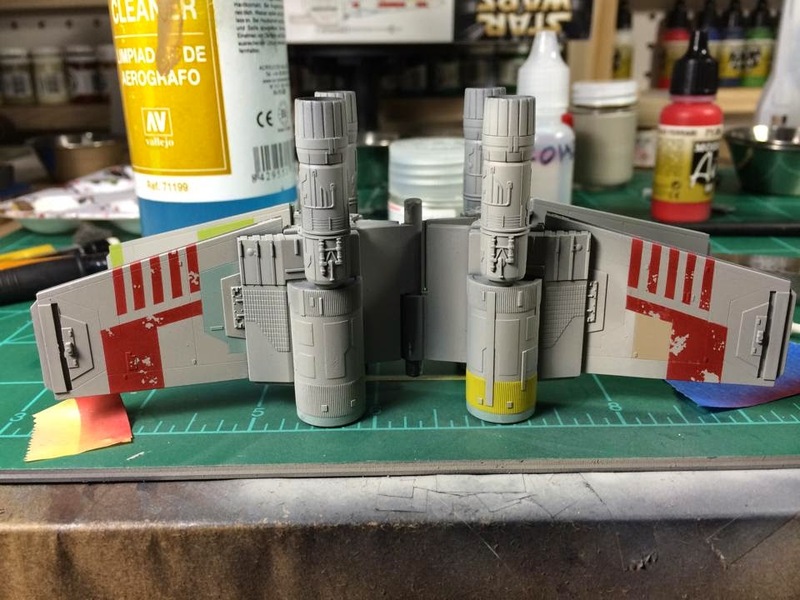 Like the panels, I decided against using the kit decals for the Red Squadron markings. 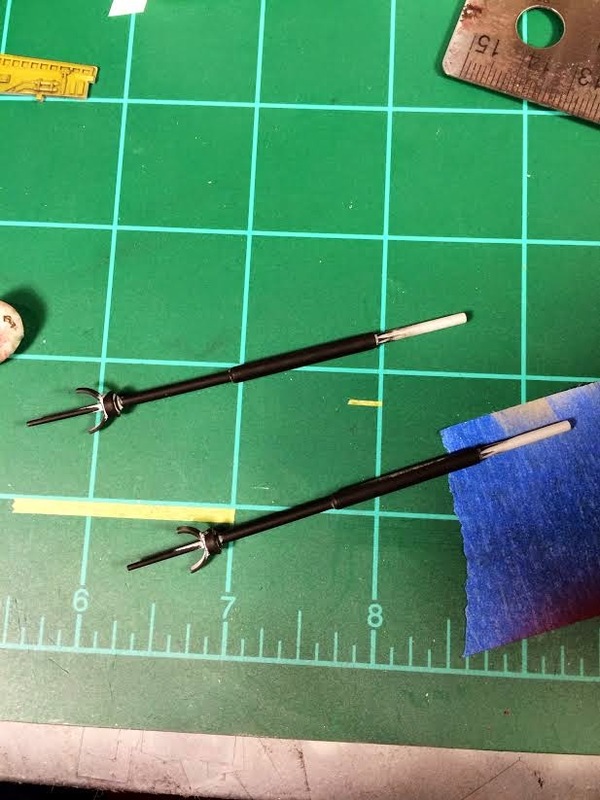 Using a combination of the decal sheet, excellent photos of the studio model, and the decal sheet, I managed to get all of the masking down for the red markings... and let's just say to took a lot of effort (and lots of ripping tape off in frustration). In the end, I was pleased with how it looked and after carefully studying it (and getting a second opinion from my wife), I decided it was pretty symmetrical. Before spraying the red, I dabbed on some Vallejo Liquid Mask with a piece of foam to simulate paint chips on the red markings. After the masking fluid dried, it was time to spray the red markings on. I had first decided to use Tamiay Flat Red (XF-7) as the red color. I thought it was a little too bright, but nothing I couldn't darken after a couple of filters, washes, and weathering. When I first started spraying the red, I quickly discovered that I had thinned it too much, and combined with the coat of Future, it started running everywhere. I tried to wipe most of it up with it was still wet but ended up with a fingerprint in the red area. Since red is a translucent color, I decided to try and remove it with a little bit of alcohol. This turned out to be a mistake as the alcohol attacked the Future in the soon-to-be red area and ate away some of the base color. I repaired the exposed area with the base color and sprayed the red paint, this time using a mixture of VMA Italian Red and VMA Hull Red mixed 2:1. After the pain dried I used a piece of poster tack to remove the liquid mask. Upon removing the mask, I discovered that the alcohol had bleed underneath and damaged the paint, so I fixed that area which ended up making that part brighter than the rest of the wing. That should be okay because filters, washes, and weathering will darken it. Plus, the X-wing has a little bit of a mottled look due to the wear and tear on them. I added the brownish panel on the port wing using Tamiya Buff (XF-57), yet another detail missed in the kit instructions but clearly visible on the studio model. I attempted to apply the "barber stripe" decals on two of the laser cannons, but I couldn't get the decals to set right. 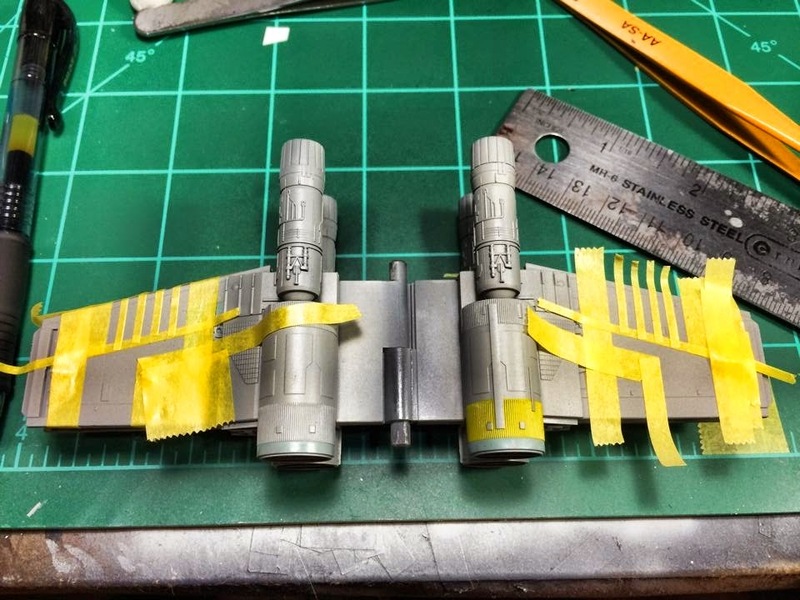 Since I hate working with decals anways, I just striped the two laser cannons and I'll just repaint them and add the stripes by hand. Lesson learned! That's it for now! The next step will be painting the fuselage and adding the wings.